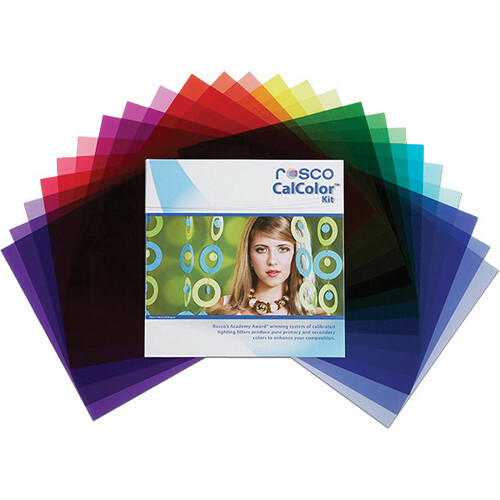 The 12 x 12" Rosco CalColor Filter Kit is a patented system of lighting filters that is calibrated to produce pure primary, secondary and two tertiary colors for the camera. Comprised of four graduated densities (15, 30, 60, and 90) of blue, green, yellow, red, magenta, pink and lavender filters, it also contains 5 densities of cyan filtration. Each filter in the CalColor system can be used to predictably add or subtract color from your shot. Box Dimensions (LxWxH) 12.6 x 12.2 x 0.4"
CalColor Filter Kit (12 x 12") is rated 4.5 out of 5 by 4. Rated 5 out of 5 by Ralock from Great filters! I've only had a few chances to use them but from what I've noticed they give off great color and allow me to be more creative with my photos. Rated 4 out of 5 by William D. from Great for light painting Love them! Are these filters heat resistant? Yes, the filters in the Rosco CalColor Filter Kit (12 x 12 ) has a heat-resistant PET polyester base.